If the only trends were the ones listed by Dr. Sable, we’d be in deep deep…trouble. But I’m pretty sure there’s a trend that’s missing from this retired endocrinologist’s piece. 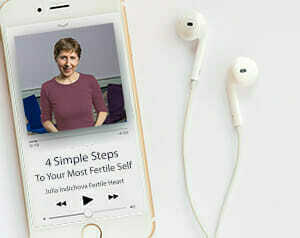 What’s missing is a trend some of us have been part of for a while; a trend toward waking up to our own power to create change in our bodies; a trend toward learning what action we can take to increase our fertility without the help of Ovascience. the pharmaceutical company that announced closing of $132 million public offering of common stock. Ovascience is a pharmaceutical company that is promising to fix all our egg-quality issues. Now where have we heard that before? Ovascience is also a publicly owned company in which the author of this piece can invest. He tells us so. Could that have influenced his point of view? Which of these trends serves the interest of the children we so desperately long to bring into the world? When I read (and reread) this article, I see a bunch of bandaids. No cures, no solutions, only bandaids. I know that IVF and ART can be a healing tool for some people, but I think that’s the minority, not the majority. Ironically, my fertility clinic hosted a mind-body fertility conference, yet when I was a receiving ART treatments there (only the previous year), there was ZERO mind-body talk or holistic advice outside of the conventional medical route, even though I specifically asked about it. Exactly Joanne! When I mentioned this FH work to my RE, he shrugged, smiled at me and said “if it helps you relax, that’s nice.” WTH? Another RE told me to get a massage, and that was the extent of the mind-body work there. And another told me to take nothing at all except for the fertility drugs. It’s frustrating. I wish more doctors would understand or at least accept the need for a whole-body/mind fertility picture instead of just zooming in on the ovaries. I must admit, I struggled to post on this one. Not because I didn’t have anything to say, but I found the 3 IVF cycles we went through such a difficult experience that it took me several days before I could even bring myself to read the article. Let me be clear, I had the IVF cycles before I discovered Julia’s work and the Fertile Heart community. If I had known about these things then, I think I would have had more tools for the treatment to have been an opportunity (whatever the outcome); rather than viewed as the gruelling experience I remember it as. The first thing I want to say is that the clinic we went to was a major clinic in the N. East of England, taking both private and NHS patients. However; it was no where near the size of what I imagine the mega clinics the article talks about to be. There were about 5 beds for egg collection patients. Nevertheless, we did feel we were on a bit of an IVF conveyor belt, stats rather than people. Nobody seemed very interested in the fact that I had just lost my mother to ovarian cancer, and maybe that in some way could be linked to my (at that point) slightly raised FSH. There was no real help with guidance on anything we could do to help ourselves; diet and lifestyle advice consisted of checking that we didn’t smoke and weren’t drinking alcohol. The only emotional support we were offered was to see an NHS counsellor at other premises whom I can only assume was not specifically trained in issues to do with fertility. She told me it was good that my husband had bought me a cat as “Now you have something to mother.” Needless to say I did not go back for a second appointment! During the course of our 3 cycles we met staff who were incredibly kind, and staff who despite whole careers working in this field do not have a deep understanding of the far reaching implications of infertility on every aspect of an individual’s life. I am still coming to terms with the fact that during the treatment, at the age of 31 I was made to feel like a “prematurely” “old” “failure” : their words not mine. There are numerous examples of both kinds of treatment I could give here. However I will try and keep to the main points the article made me think about. Firstly issues around funding: Though funding is different in the U.K. and the USA what I want to say in many respects applies wherever you are. Whether your insurance covers you for treatment, or whether the postcode lottery in the UK means you find yourself entitled to up to 3 treatments on the NHS (as we were) does not necessarily mean that taking that course of action is right for you. 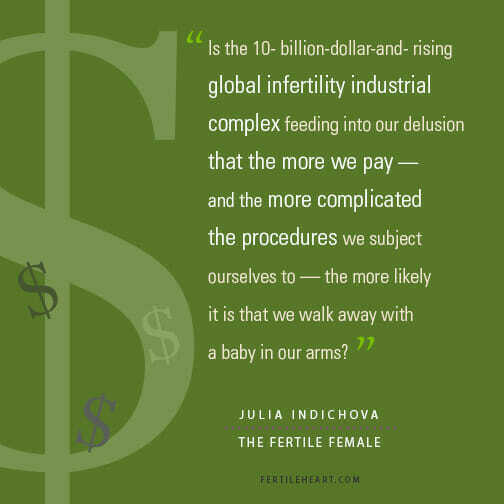 The financial costs of IVF are huge, and there is so much emotion around that. I could almost feel the weight of other people’s pain who would have loved to have been in our position and been entitled to 3 free chances; and because of that almost felt my gratitude for the treatment I was being rushed into should be so high, that I really didn’t have the right to question whether this was right for me, or indeed what I wanted. Like I say this was before I discovered Fertile Heart. The immense pressure around the financial side of treatment (whichever way it falls for you) does nothing to help couples make good choices. The other thing that I wanted to say was that despite finding it an incredibly difficult experience. IVF can be an opportunity for personal growth. Though this was before I discovered FH in two of my cycles I practiced what I have come to see as a very basic form of body truth and meditation, and in one I didn’t. In the two cycles in which I did this I got as far as having two embryos put back both times, in the one in which I didn’t, I did not produce any eggs. I really learned the mind body connection through my treatment cycles; and consequently had no problem being completely open to the FH tools when I later discovered them. During my treatment cycles I really learned that nobody has control over what happens in my body, but her majesty the heart. Finally, I go to a maternity yoga class once a week now. This week a new lady started the class and at the end approached me. I explained that I’m not pregnant but attending in the hope that it helps, and she confided in me that her pregnancy was as the result of an IVF cycle, and she touched my arm and said “I really hope it works out for you.” I have to say that meant the world to me. It is so easy to when I am surrounded by all the other bumps in the room to wipe away what experience has taught me; everybody has a journey and a story, and often other people’s journeys are nowhere near as straight forward as we imagine them to be. I am sorry this is such a long post, but this blog really opened a flood gate for me! oh wow… don’t apologise for letting the water pour – its such a brilliant personal testimony of what this is all about. There are so many pertinent things in your post but I have to praise you for this one; “but you wouldn’t feel like this if the treatment had worked”. I think I’ve rattled this one round in my head so very often I can’t believe I’ve never actually vocalised it myself – until now! Thank you so much for giving me this opportunity. I do feel resentful of having been part of this conveyor belt and frankly I feel there is nothing personal in a treatment protocol when you realise everyone you meet (IVF patient and non IVF patient) are taking the same brands and amounts of steroids, intralipids, progesterone, aspirin, folic acid and clexane as you are! And how expensive is Clexane – given some believe VIT E does the same job surely the pharmaceutical companies should be researching this – I’m guessing its profitless. I struggle with this a lot and I don’t think I would be moaning if I was holding a baby in my arms as a result of the technology, pharmaceuticals and expense. I have very dear friends who are nothing but grateful loving parents as result of their doctors and treatments but because I’m not (holding a baby in my arms that is) I don’t feel able to shout my criticisms too loudly! By the way, your super young! Your sentiment is so beautifully written but I’m not surprised as you are a beautiful soul. I am so honored I had the opportunity to meet you in Woodstock. Your story is inspirational . How interesting to see the financial differences in the countries around the world. You bring up a very powerful point about how the pressure , either way it’s imposed on you, does little to help when deciding which road to travel. At first, one may think being “lucky” enough to be granted the funds for 3 rounds of IVF is a beautiful gift. But as you state, if you have any orphans around that situation it can be quite intimidating. Thank you Lori, you are so kind. I find it much easier going to the maternity yoga class than I thought I would, in fact it has become a highlight in my week. The other class members are very supportive; however how comfortable and healing it is to attend such a class I really think depends on the teacher. Good point Ruth.. I think most of what we learn in life definitely depends on the teacher . Glad you are enjoying it so much! Ruth, I wanted to thank you for your beautiful post, and I also wanted to thank you for shedding light on something for me. I’ve always figured IVF is my ace in the hole, because our insurance covers up to three rounds. Like you, I have felt almost a pressure to accept that and be insanely grateful for that. But is it the right path for me? To be honest, I find myself thinking “…I don’t know. Maybe IVF. BUT insurance pays! We need to do it!” I realized I’m basing my answer from a place of panic and financial fear. Your comment made me realize I don’t HAVE to do something just because I can, and so maybe I need to chew on this a little while longer before making decisions. Thank you. I wish we had just taken things one step at a time, and allowed ourselves to think if we do one cycle we’ll see how we feel afterwards and make further decisions then; instead of saying from the very beginning we’ll do all three cycles. Great point! I just view (wrong, I realize) IVF as this “sure thing.” Even though I know chemical induction and artificial hormones really destroy me. I took 100mg of Clomid, made a whole bunch of eggs (that didn’t turn into babies), and then spent MONTHS recovering both physically and emotionally. My husband is not excited about how the much-more serious medical protocol of an IVF cycle will affect me. And yet I still keep hanging on to this option, mainly because we would pay so little for it. This is so not Visionary. I feel the trend that best serves us is the FH ovum practice. Of course, I understand there are times when some of us may need ART but using the tools alongside that journey is probably best for our babies. I say this because through this practice we are birthing our newest, best self continuously. What better gift to give to our children than our best self? As an older, hopeful mom to be, I know that I would be the best mom now vs. 10 years ago, or even 2 yrs ago. These pharmaceutical companies are in it for the profit. (This is my opinion only, but I feel strongly about it. ) I’m curious as to the owners, president, vp, board members, etc., are they men? women? Have they, themselves gone through a fertility journey? What connection, what do they or did they have to invest in this research and production of “medication”? There isn’t any medication to heal our heartbreak and isn’t that what we should heal before our bodies? Before we bring a new life into our heartbreak? This is a great concept that’s personal to everyone individually. Technology and medical advances have given people more power to overcome physical weakness. Then the other challenge is finding self acceptance and true happiness. Thanks for the great post! Several years ago aged 39 I felt so fearful of not having children and I went through an egg freezing procedure. I was single, quite unwell physically with a health condition, and suffering a lot emotionally. Now I am apparently too old to conceive naturally according to the ‘experts’ (I’m in my mid-forties). But I’m now in a loving relationship which I feel is strengthening in part due to using fertile heart tools. I no longer feel my orphans are running the show anywhere near as much as before. I’m learning to look beyond the “I have to have a child” to see what is it in me that needs healing. For me this is my journey, wherever it may take me! I’ve also learnt to not be blinded by statistics! My dad was born with a congenital heart defect and a doctor told his mum he wouldn’t live beyond 6 years old. In fact he lived to be 60! Liz your doing so well to be looking beyond your need for a child. I’m only just starting to realise that I can choose to live my life miserably not having gotten what I wanted (baby! ), or, choose to find the joy in the life I have. I’m not giving up, my desire for a child is still strong, but if this journey is going to bring about a ‘better me’ I have to do something different be something different. I want my choices to be made from within my heart, very often I think I’m making them from desperation and anxiety. I keep asking myself what is it I can learn from this experience that I couldn’t possibly learn any other way (a question Julia posed during one of the circle’s). Have you read Julia’s e-book, “What to expect from a fertility expert”? Its quite helpful. Recently I’ve questioned myself; will it be OK if I don’t have a baby, will I be OK? I think the answer can only be a ‘yes’ if I make my life ‘today’ count. Your dad was an amazing man, and I’m sure he felt so gifted to have lived such a fruitful life and had such an amazing daughter. This article,is an eye opened.. I live in France where standard ART is available at veey low or minimal cost upto a certain age limit and number of cycles. On my baby journey I got a place where I was ready to try IVF . I gently moved to this decision using the Ovum practise and I was not going in as a victim. I was very blessed to conceive naturally just before starting. I think ART has huge benefits and should be available, but I think a lot of people involved and driving the industry are more concerned about money than the humans in front of them. I think there are a lot of people with questionable ethics in the business and this needs to stop ! The article was both frustrating and a bit promising. For those who truly need IVF or genetic screening, it would be wonderful to have it more accessible and less of a huge financial burden. But the thoughts of it becoming the norm, or the creation of those “mega-clinics” becoming commonplace, is just depressing beyond words. For a year, I held off seeing a fertility specialist because I knew I would get the IVF/donor egg speech. And I did. The power of a medical professional’s words is so intense! Even if they say positive things to us, it’s the damning or harmful phrases that stick like thorns into our psyche. One doctor told me that I’m luckier than 99 percent of his patients because I already have children so I need to figure out why I want to keep trying to have another when it’s basically a sure thing that I will fail. And I wonder why I feel guilty and upset along this journey? And let’s not forget about the doctor who didn’t even LOOK at my lab results (which were fine, by the way), only my age, and spout off a 2-percent chance of me EVER having another child. “But I can boost that to more than 80 percent at least with a donor egg,” he said. Then, after he examined me and gave me an ultrasound, he was visibly shocked. “Wow, these aren’t the ovaries of a 42-year-old woman,” he said. “They belong to someone much younger. I’m upping your chance to 4 percent!” Uh, thanks? I agree with Heather and MH! The trend of becoming our own authority and stepping into the power of our Visionary self! I continue to be flabbergasted by the way medicine has turned into a pill throwing, shot giving, shut up and listen to the doctor arena. Didn’t I hear you say once that doctor in latin means “to teach”. I feel it should be an arm and arm experience with your doctor and be able to look at the individuals circumstance rather than just bringing statistics. Having this experience that I have in the fertility world really does open my eyes as a nurse in my field. All patients in all situations would do better to become their authorities. We are bodies with flesh and bone and blood but we are also beings with emotions and beliefs and fears and those should really be taken in to account in our whole health. Thanks for this article Julia ! I kept smiling the whole time I read the 7 trends and was visualizing how every couple could get into this IVF journey after just 6 months of TTC or less because all this is so fancy and sounds so promising, especially if the insurance gets covered….what a boon :) …Haha !! Now a days no one has time to really think of “SELF” or making ourselves our own authority. This trend seems to be foreign to most of them, be it fertility journey or in general life’s journey. IN fact this might not even make any sense. I have tried speaking on various aspects of life with several of them and I kind of see that someone else is always seen as an authority. I just remember the story in your fertile female book of the 3 angels hiding the supreme power of human knowledge in the deepest layers of his own heart. Unfortunately that is so true and is the most difficult thing to follow our heart and hear and give power to our inner voice. I can’t thank GOD enough for making me choose the trend that he developed and always wanted every human to walk on – Self awareness, be your own authority, listening and honoring inner voice. If not for him, I would have never found you and Fertile Heart. Some times we need to go through various struggles in order to identify and choose such self enhancing trends. This article made my path even more clearer, I feel even more determined to meet my baby halfway, I feel confident that I am on the right path. This path is revealing the beauties of life to me at this moment. My first reaction in reading the Forbes Article was mixed. My insurance does not cover ONE CENT of the cost of IUI/IVF/ART, which has always bothered me but if I have a genetic ” defect” it would? Do we really want to give insurance companies the right to decided who, why, and how on IVF? The cost of IVF is insane and I believe highly inflated but the idea of a Mega-Clinics seems very 1984 to me. ” seductive” science. If the 3 parent IVF was available here I can’t help but wonder how that would impact my decision making. I don’t know that any of the trends serves the best interest of our babies. I fear that the misuse of genetic screening would lead to ethical issues BUT I understand the importance of screening certain diseases. Like I said, mixed emotions and reactions. My mind is reeling after this article- so overwhelming. ” trends ” that Julia/FH community have been encouraging for so many years, healthy eating and living, exercise, body movement, imagery, dream work, that mind-body-heart-experience, connecting with the voices within you. What a gentle and loving way to nourish the palace our babies will grow in and ourselves as well. As you say, “The cost of IVF is insane and I believe highly inflated but the idea of a Mega-Clinics seems very 1984 to me.” Yes, pretty scary! Articles like this are important. They call on us to choose. Not between ART and natural conception But to choose to speak up about the dark side of the industry. Massive amount of money goes into promoting the benefits of ART. Very little into pointing out the dangers to all of us, especially our children. Thank you, Heather!